Don Anderson is a Senior Scientist in the Biology Department of the Woods Hole Oceanographic Institution. He earned three degrees from MIT – a BS in Mechanical Engineering in 1970, and a MS (1975) and PhD in Civil and Environmental Engineering in 1977. He joined the scientific staff at WHOI in 1978. In 1993, he was awarded the Stanley W. Watson Chair for Excellence in Oceanography, in 1999 was named a NOAA Environmental Hero, and in 2006 received the Yasumoto Lifetime Achievement Award from the International Society for the Study of Harmful Algae (ISSHA). Anderson is the former director of WHOI’s Coastal Ocean Institute (COI), and presently serves as Director of the NOAA Cooperative Institute for North Atlantic Research (CINAR). Anderson also serves as Director of the U.S. National Office for Harmful Algal Blooms. Anderson’s research focus is on toxic or harmful algal blooms (HABs), commonly called “red tides”, utilizing approaches ranging from molecular and cellular studies of toxin genetics and regulation to the large-scale oceanography and ecology of the “blooms” of these microorganisms. He is also heavily involved in national and international program development for research, monitoring, and training on red tides, marine biotoxins, and harmful algal blooms (HABs). Anderson is the author, co-author, or editor of over 250 scientific papers and 14 books. Kevin G. Sellner serves as Executive Director of the Chesapeake Research Consortium. His primary role in this position is to encourage active research programs across the six Consortium member institutions (www.chesapeake.org) and their extended partners from agencies, other institutions, and NGOs in the Chesapeake watershed focusing on fundamental basic and applied air, land, and water-related research to inform science-based management in the region. He strives to insure that the Consortium is considered a source of unbiased scientific information for most groups, organizations, and agencies across the basin, providing topic-specific workshops, conferences, fora, and reviews on critical regional issues. As part of that role, Sellner serves as the Executive Secretary of the Chesapeake Bay Program’s Scientific and Technical Advisory Committee, member of the MD Harmful Algal Task Force, and organizer of the Chesapeake Community Modeling Program. Sellner is also a plankton ecologist active for the past 30+ years, with a primary focus on harmful algal blooms (HAB), examining fate and impacts of cyanobacteria and dinoflagellate bloom production in regional systems as well as waters of the Baltic and Peru. He has served on the National Harmful Algal Bloom Committee (NHC), was the initial program officer for the Federal interagency research program ECOHAB (Ecology and Oceanography of Harmful Algal Blooms), co-written several national HAB reports, and has briefed Congress members and staff on these problem taxa several times in the past decade, and has served as an Associate Editor for several oceanographic and watershed management, journals. He also leads a graduate seminar HAB course in the UMD Marine Estuarine Environmental Science program. He mentored and Honors undergraduate research team from the UMD GEMSTONE Program that has yielded a field mitigation technology for reducing algal blooms in the natural environment which has now been expanded into a NOAA-funded 3-yr research program; the goal of the project is to develop an inexpensive state-administered mitigation technique for routine use in MD and other coastal areas to remove these blooms and reduce citizen and animal exposures to these toxic algal accumulations. Gail Hesse is the Executive Director of the Ohio Lake Erie Commission, a consortium of six state agencies established for the purpose of preserving Lake Erie's natural resources, protecting the quality of its waters and ecosystem and promoting economic development in the region. Prior to her appointment to the Commission, Gail was with Ohio EPA and responsible for administering Ohio EPA’s Lake Erie restoration and protection and inland lakes programs. She serves as chair for the Ohio Lake Erie Phosphorus Task Force, a multi-stakeholder effort that analyzes the causes and issues related to algal blooms in Lake Erie. She also served as administrator of the Ohio Water Resources Council, a consortium of state agencies and commissions established to promote collaboration on water policy and program development. She has a master’s degree in environmental studies and a bachelor’s degree in geography both from Ohio University. She is also a graduate of the Ohio Certified Public Manager program, a nationally accredited two year leadership development program for management in the public sector. Gail is a former president of Hostelling International-USA, a national nonprofit organization dedicated to cultural understanding through travel. She also served eight years as an internationally elected board of trustee member for the International Youth Hostel Federation. Dan L. Ayres is a Shellfish Biologist who leads the Washington Department of Fish and Wildlife’s coastal shellfish unit based in Montesano and Willapa Bay. 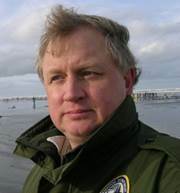 He manages Washington’s very popular razor clam fishery and oversees the unit’s work managing the coastal Dungeness crab, pink shrimp and spot prawn fisheries, the Willapa Bay oyster reserves and research projects in Willapa Bay. These fisheries are the backbone of the economies of the small coastal communities that are found on Washington State’s outer coast. The coastal commercial Dungeness crab fishery is the largest commercial fishery in the state with seasonal ex-vessel values that exceed $50 million. The recreational razor clam fishery can seasonally draw up to 350,000 diggers, who spend an estimated $33 million in tourist-related income. Pristine Willapa Bay, located on the south Washington coast, produces 10 percent of the nation’s oysters. All of these fisheries have either been threatened by or directly affected by harmful algal blooms. As a result, Dan has worked closely with other state and federal agencies on harmful algal bloom issues since the marine toxin domoic acid was first found along the Washington Coast in 1991. He just completed two terms on the National Harmful Algal Bloom Committee. He has represented WDFW in testimony on this topic at both the Washington State Legislature and the U.S. Congress. He has collaborated on several national HAB plans including the Harmful Algal Research and Response: A National Environmental Science Strategy. 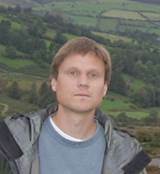 He also worked to organize the recently held West Coast HAB Summit (2009) and is co-chair of the team working to developing a West Coast HAB Monitoring Network plan. Dan was born and raised on the Washington coast and was first introduced to razor clam digging by his parents at a very young age. He is a graduate the University of Washington. Dan first met his wife Gail when she was a news reporter assigned to do a story on the razor clam fishery. They live in Montesano with their two daughters aged 11 and 13. Alina Corcoran is a phytoplankton ecologist who directs the Harmful Algal Bloom (HAB) Program of the Fish and Wildlife Research Institute (FWRI), the research arm of the Florida Fish and Wildlife Conservation Commission. Under Corcoran’s oversight, the HAB program has expanded its focus from the red tide organism, Karenia brevis, to entire phytoplankton communities in the coastal waters of southwest Florida. She has also set up a long-term phytoplankton monitoring program in Pinellas County, which serves as a pilot study for other monitoring stations throughout the state. Corcoran’s research interests are extremely diverse, but there is a common thread that connects her projects – clear applications to ecosystem management and sustainability. 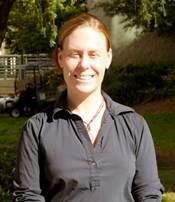 As a graduate student, Corcoran studied the effects of stormwater runoff and wastewater discharge on phytoplankton in the Southern California Bight. As a postdoctoral researcher, she used ecological principles to engineer stable and productive biofuel systems in the deserts of New Mexico. Corcoran is currently investigating the effects of nutrient limitation on toxicity of the red tide organism, Karenia brevis. Corcoran earned a B.A. in Biology at Boston University, M.S. in Marine Science at the University of Alabama, and Ph.D. in Biology at the University of California Los Angeles. She joined FWRI in June 2011. John Goss serves as the principal advisor to The White House Council on Environmental Quality (CEQ) Chair Nancy Sutley on Asian carp issues. Goss is chair of the Asian Carp Regional Coordinating Committee (ACRCC), which is a team of Federal, state and local agencies working together to prevent Asian carp from establishing populations in the Great Lakes. Goss previously served as Director of the Indiana Department of Natural Resources and as Vice Chair of the Great Lakes Commission. Marc Gaden grew up in southeastern Michigan and has spent most of his professional career working to protect and improve the Great Lakes. He serves as Communications Director and Legislative Liaison for the Great Lakes Fishery Commission, a US/Canadian agency established by treaty to improve and perpetuate the Great Lakes fishery. He has held this position since 1995. He has worked extensively on issues involving regional coordination of fisheries policies, invasive species, and ecosystem restoration. Prior to joining the Great Lakes Fishery Commission secretariat, Dr. Gaden worked as a Legislative Assistant for the U.S. House of Representatives’ Great Lakes Task Force, researching, proposing, and advocating legislation of benefit to the Great Lakes region. Dr. Gaden also worked as a Legislative Assistant and Caseworker for U.S. Congressman Dennis M. Hertel (D-MI), specializing in Great Lakes, environment, transportation, immigration, and Social Security issues. Dr. Gaden is an adjunct assistant professor at the School of Natural Resources and Environment, University of Michigan, and an adjunct associate professor at the Department of Fisheries and Wildlife, Michigan State University. He teaches courses in environmental and water policy and has written about environmental governance, Great Lakes policy, and cooperative fishery management. Currently, he teaches the course “Global Water” at the University of Michigan. He received a Ph.D. from the University of Michigan’s School of Natural Resources and Environment in 2007, a Master of Arts degree in United States Foreign Policy from The American University in 1993, and a Bachelor of Arts degree in History and Political Science from the University of Michigan in 1991. Tim Eder serves as Executive Director of the Great Lakes Commission. In that position he is responsible for all aspects of the operation of the Commission including policy development and advocacy, fundraising, communications and staff leadership. Mr. Eder is accountable to a Board of Directors appointed largely by Great Lakes Governors and he leads them in formulating policies to advance consensus views on matters of Great Lakes conservation, protection, restoration and sound economic development. In this capacity, Mr. Eder regularly develops and presents to Congress and the federal government the views of the Great Lakes states on a wide range of budget and policy issues, including implementation of federal programs such as the Great Lakes Restoration Initiative. Mr. Eder manages a staff of 20 and an organizational budget of over $5 million. Prior to his position with the Great Lakes Commission, Mr. Eder served the National Wildlife Federation from 1989 to 2006 as Director of Water Resources, Director of the Great Lakes Regional Office, Regional Executive and Water Quality Project Manager. He led the development of the aquatic invasive species plan for the Great Lakes Regional Collaboration and served as chair of the Organisms in Trade section. He also served on the Virtual Elimination Task Force of the International Joint Commission in 1994-95. Mr. Eder served on the Board of Directors of the Great Lakes Fishery Trust and on the Board of Commissioners of the Washtenaw County Road Commission. He served with Great Lakes United from 1986 to 1989. He received a Bachelor of Science degree in water resources management from Michigan State University.